Story by Joe Benitez and M. M. Chen. 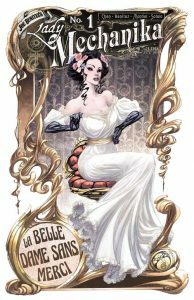 The adventures of Lady Mechanika and been on my radar for a few years now, but it wasn’t until I was able to M.M Chen at C2E2 last April that fell in love with the book. I picked up every trade they had have been waiting for the next installment since then. The steampunk genre is tough for many people to get right. Just try explaining it to your grandparents and you’ll understand. The elusive, “What is steampunk?” is like trying to explain particle physics to a toddler (which I’ve tried as well). So I can imagine the creative process behind it is daunting as well. The story picks up as Singh visits the home of Lady Mechanika to ask about a case. A man’s mechanical arm has gone missing and Singh wonders if Mechanika is involved. I wonder if he thought of questioning Rocket Raccoon? Turns out our dashing lady of metal and lace was involved but can get into the details as she is called away on other business. I’m not going to summarize the entire issue, because I would rather you go out and buy it. So I’m going to end the summary there. Strap yourself in for a dialog issue. The book doesn’t drag or seem overly wordy, but it is meant to set up the story. The exposition is still a fun read as we learn about Mechanika’s relationships through the eloquent tone of the Queen’s English (at least that’s what the voices in MY head sound like). Knowing that his sets the story up for the rest of the miniseries makes me think we’ll see more action in the next issue. The art is amazing! Joe Benitez and Martin Montiel are what drew me into the series, to begin with. Their unique style of slender figures and sharp angles coupled with the intricate steampunk-style science is breathtaking. Beth Sotelo’s color work adds a level of depth and gloss to book that is like the cherry on top of your sundae. 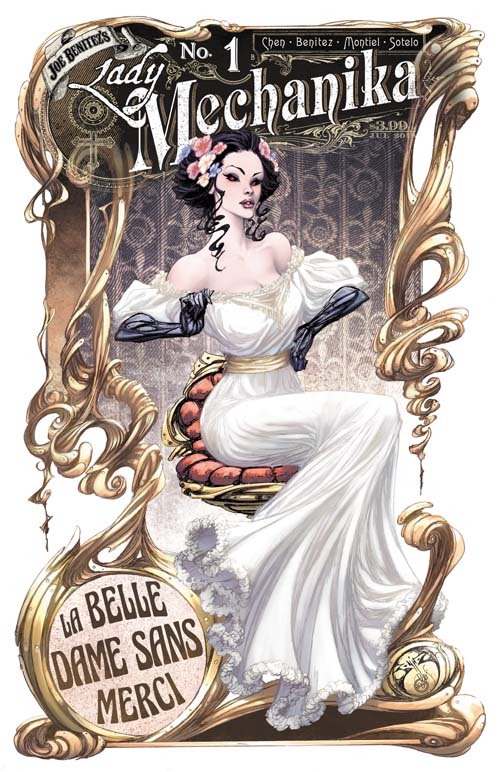 Bottom Line: Lady Mechanika: La Belle Dame Sans Merci #1 is well worth the price of admission. The writing a solid, the characters attractive, and the art is sumptuous. You’d be a downright fool not to buy this comic!